The beauty of a forest covered in a blanket of white is hard to accurately describe. As we take each step down the narrow trail path and listen to that familiar crunch of snow beneath our feet we’re captivated by the pristine condition of this wilderness. Although we’re aware that we’re not the only people that choose to winter camp here, it somehow feels completely isolated and untouched, as if we were traversing some new foreign area in search of food or shelter. Cutting across that lake (still at 2 ½ ft thickness from shore) we shave some minutes off our time and reach our campsite. 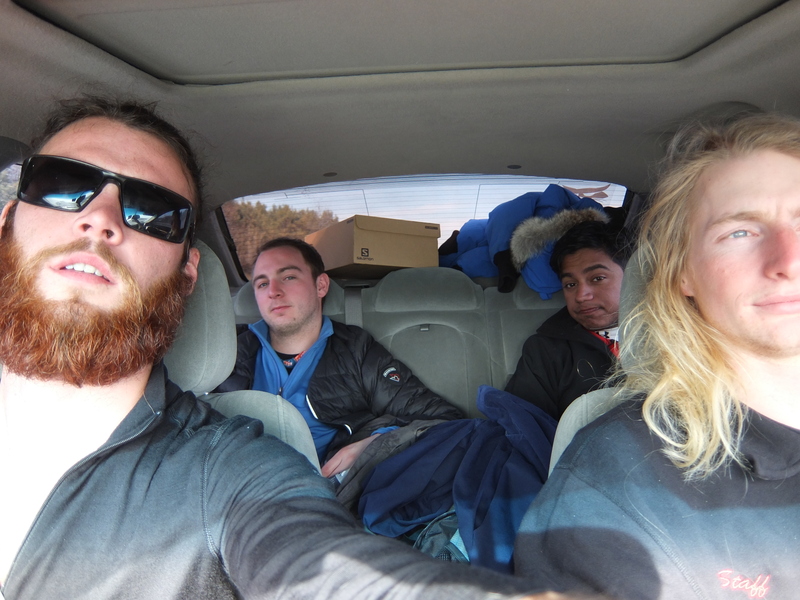 We branch off to collect wood, set up the tent, fetch water, and prepare a meal. On our own with a specific goal we quickly become intimately focused on the immediate task at hand, leaving behind any previous notions…. …We lay back, bellies full, a dark night sky thick with stars, bundled in our snow-pants and down-filled jackets, and laugh. There’s really nothing quite like winter camping. After being out of the country throughout much of South-East Asia for the last 6 months the first thing I relished when I returned was my soft, queen-sized bed. It’s sheer size; it’s soft pillow-top, and the warm duvet on top. However, although I enjoyed my luxurious sleeps and my home-cooked meals it only took a few days before I began again to get a familiar itch. So I sent a few messages around to see who may be interested in the 2nd annual winter camping trip, and voila! 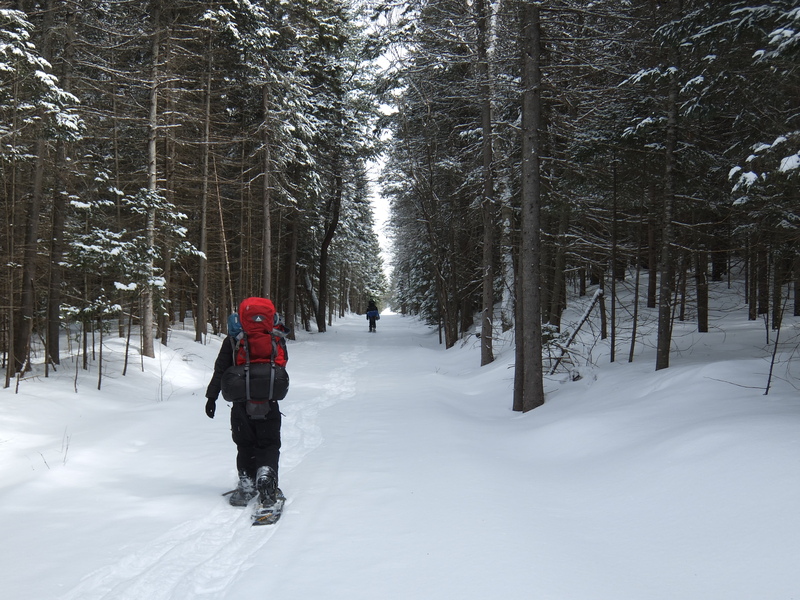 A few days later we were pulling into Algonquin’s Highland Trailhead with hearts full of hope and a Chevy Impala backed to the brim. Algonquin’s Highland train offers backpackers two options: First, a 19km blue loop, which encloses Provoking Lake, or the 35km yellow loop that leads up towards two other small pocket lakes. In the spring, summer, or fall the yellow loop is a solid 3-day outing, however, in the winter months without the proper gear it’s a fairly risky bid. 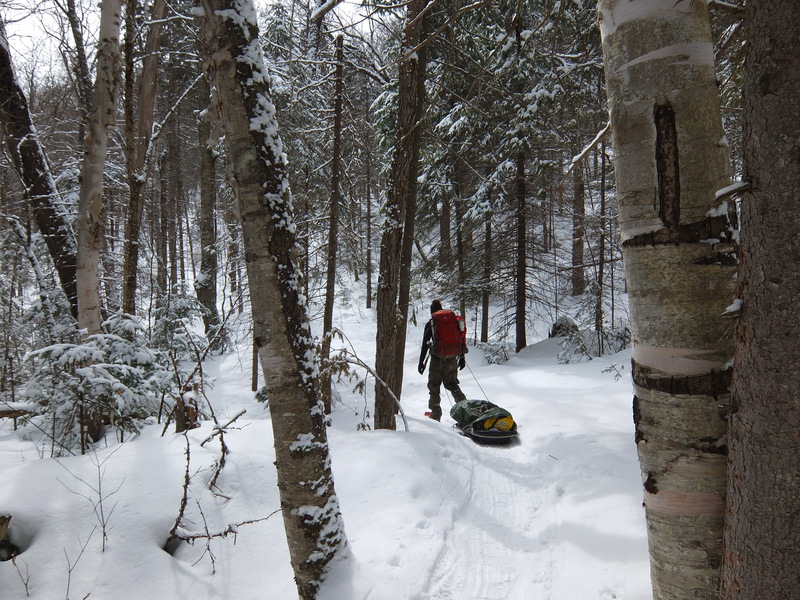 Our group of 4 decided on neither of these loops, simply taking a portion of the opening highland trail head to the adjacent Track & Tower Trail, leading us to a short portage that cuts rights to the opening of Provoking Lake. We then augured a hole, checked the depth, and sped off across the flat ice with our packs and a sled in tow. 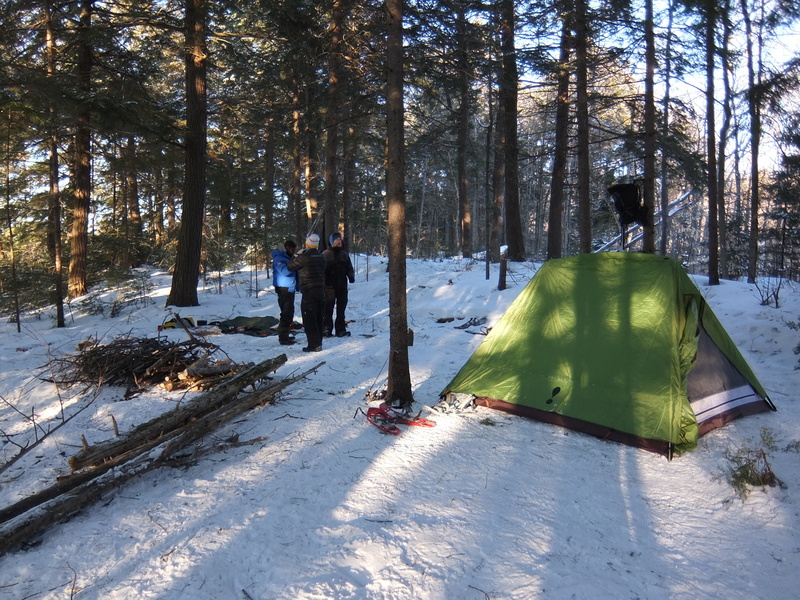 Our experience winter camping has dictated that it’s more enjoyable to have a solid base-camp and simply make day excursions from that central point, which generally has solid wind protection and a good amount of collected wood – rather than pack up and move camp each day. 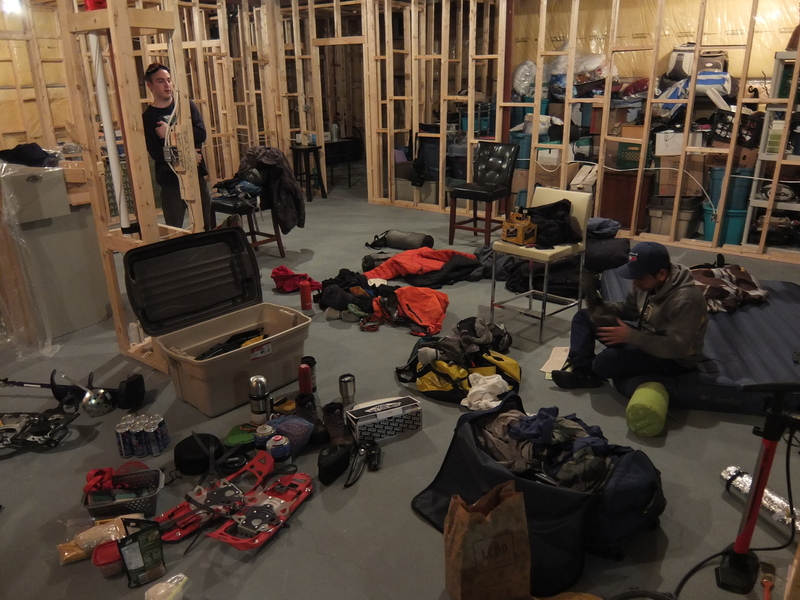 I’d like to consider myself a seasoned camper, backpacker, canoeist, whatever it may be. However, I’ve never made so blunders as in this trip – but I suppose that lasting memory is what brings a smile to my face when thinking back on the trip. We left Algonquin Outfitters with a couple rented sleeping bags and drove the 45 minutes to find the Track & Tower Trailhead. Unfortunately, we were unable to find it due to excess in snow, after 20 minutes of searching we stumbled across it only to find a ‘No Overnight Parking’ sign. In defeat we drive to the original Highland trailhead and the second we opened the trunk I remembered that we forgot to grab stove fuel. Back in the car to drove the 30 minutes to AO, picked up 5 canisters and turned around to return. However, halfway through the ride the gas light turned on… We’d already wasted so much time we just decided it would have to be a problem we dealt with in a few days. 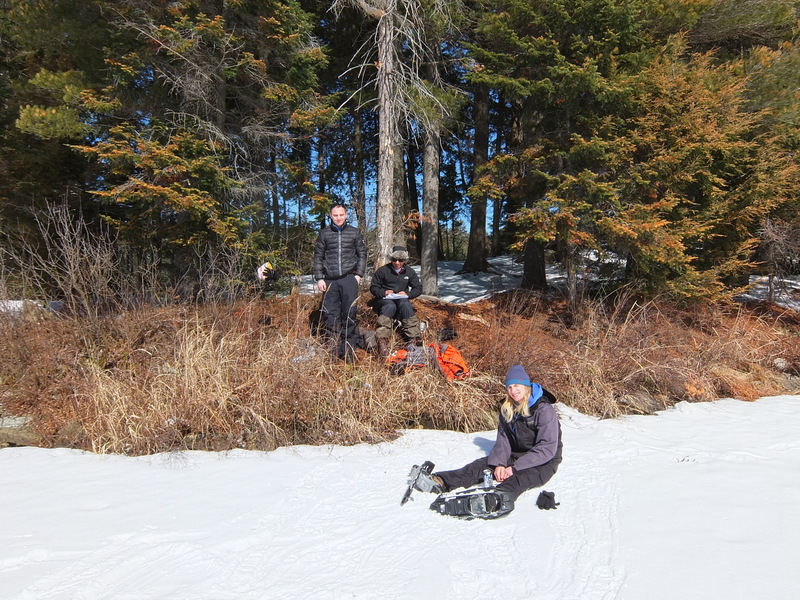 This trip, unlike the last, we thought it’d be a good idea to bring a sled. Assuming we can carry tons of weight, without much hassle. However, a sled is not like a canoe that can carry tons of weight without too much encumbrance, you REALLY feel the weight. Two boxes or wine, 18 tall cans of beer, and a couple bottles of liquor (yes, for a 2-night trip) totaled about 10L of liquid and we felt every pound! Finally we arrived at the site with broad smiles across our faces and aching legs. It was blue bird days so we basked underneath the sunlight as we prepared camp and poured a few drinks. From this point on, this is what we came to do. Literally just survive. Chop wood, carry water, cook food, and enjoy the simplicity of basic focused tasks at hand while in good company. 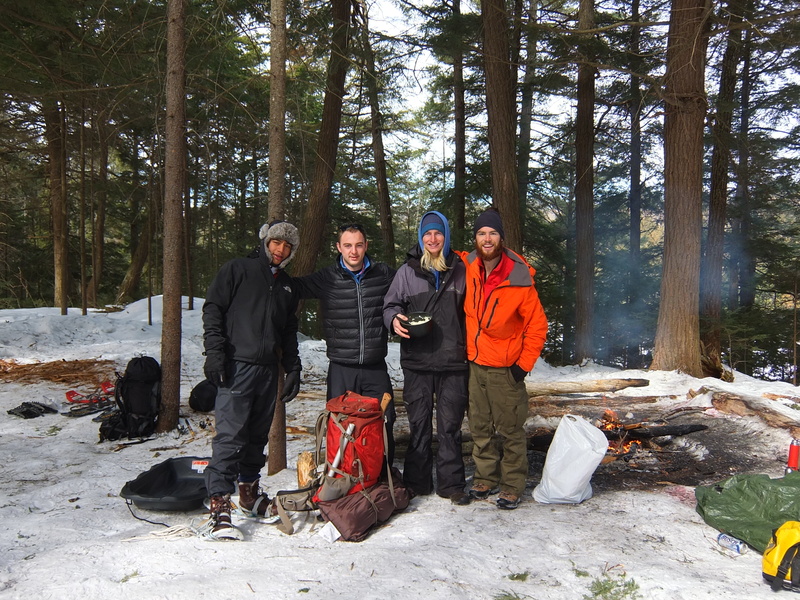 The night sky was dark and full of starts, the fire was hot, and the dehydrated food packs tasted better than ever. Day two was without a cloud in the sky and right form the start we kept ourselves busy. Once most of the chores were taken care of we decided to have a little adventure across the lake and just be “out in it maaaaaaan”. That night we had much to celebrate. We figured since we’d hauled in all our tasty beverages we owed it to ourselves to finish them, and finish them we did. As the fire grew so did our stories and we each took a little time to shed some light on ourselves. There’s something about hiking out into the woods and being in a primal state that allow people to lower their guard enough to achieve a certain level of authenticity in conversation that’s not always present. Waking up in the morning we realized that we’d left all the food outside out of the food bag and alas, our oatmeal, brown sugar, peanut butter… pretty much everything except a bag of rice and some chicken broth had be scavenged by furry bushy tailed critters. So we ate a delicious meal of rice and chicken broth, packed our bags, and headed back to the trailhead with sore heads but happy hearts. After a short two-hour hike we reached the Impala and loader her up. Feeling accomplished we soon realized we had yet another obstacle to tackle, the gas. A cruise control of 80km/h and all the heat turned off allowed us to make the distance, and we were soon speeding off towards a much-needed Harvey’s burger. It may not have been the most fluid trip, but it’s difficult to detract from the strong positive impression left on you from spending time in the wilderness. We’ll see what the 3rd annual has to offer.